This article was updated in January 2019 to reflect functional modifications to the StockOpter.com Share Diversification Analysis. Originally this function compared the value of a client's owned shares to the value of their other investments over a 5 year period. This ignored the value of any vested stock options and subsequently underestimated the overall level of concentration. This updated version of the StockOpter Diversification Analysis factors in option value to illustrate how owned share diversification effects concentrated stock positions. As restricted stock and/or performance grants vest over time, recipients will have a higher concentration in their company stock. Concentrated company stock positions are inherently risky. Even the best companies can suffer depressed stock prices due to external factors often beyond the control of management. Consequently, it is prudent to periodically diversify and reinvest some of these holdings in a balanced portfolio. 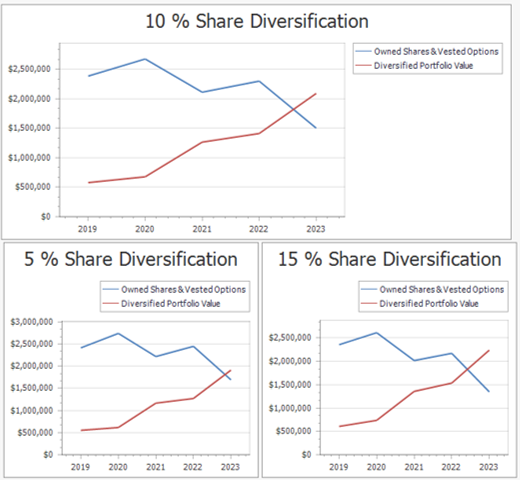 Determining when and how much to diversify can be facilitated by simulating the future consequence of different levels of annual diversification using the StockOpter.com Share Diversification analysis. The Share Price row projects the year end company stock price using the current stock price and the estimated growth rate. The first year in this example is prorated based on the date of this analysis: 1/17/2019. The Beginning Year Owned Shares + Net Restricted Shares Vesting row shows how many shares are available to sell each year. This is the number of shares owned outright at the present time plus the number of restricted/performance shares that are scheduled to vest each year less shares that are withheld for taxes (applying the “Tax Withholding Rate”) and any shares that are sold that year. The Average Cost Basis per Share Before Sale row is derived from the original total cost basis of the owned shares plus the estimated stock price of the shares vesting each year. Please note that StockOpter Pro can be used to calculate capital gains based on the cost basis for each tax lot. The Owned Shares to Sell values are calculated using the “Diversification Percentage” assumption. The After Tax Proceeds from Shares Sold & Expiring Options is calculated using the share price, the cost basis and the “Capital Gains Rate” (this assumes the shares sold are held for at least 1 year). This row also includes the after tax value of any vested options that expire each year at the assumed annual share price. The Pre Tax Value of Owned Shares & Vested Options row calculates the value of the remaining company shares and the intrinsic value of any vested options using the current "Share Price." The proceeds from the shares sold are added to the Pre Tax Value of the Diversified Portfolio (VDP) row and the “VDP Growth Rate” is applied to calculate the year-end totals. The % Company Stock Holdings row shows the percentage of the "Pre-Tax Value of the Owned Shares and Vested Options" to the "Pre-Tax Value of the Diversified Portfolio." The table data is converted into a graph to illustrate the relationship between the value of the "Owned Shares & Vested Options" to the "Diversified Portfolio Value" over the 5-year period. It shows the effects of this diversification scenario and whether the recipient is staying concentrated. The 2 bottom graphs change the “Diversification %” in '+' and '-' increments of 5% to compare alternative diversification scenarios. This will help determine how much to diversify and reinvest each year. Additional scenarios using modified assumptions can be modeled using the StockOpter.com dashboards.